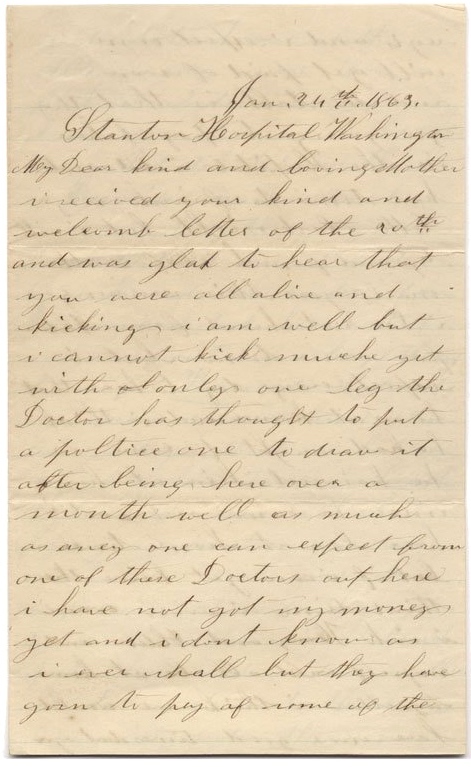 When this letter was written by Horace Augustus Derry of Co. D, 20th Massachusetts Infantry in late November 1862, the Army of the Potomac was under the new command of Ambrose Burnside who pledged to take the army directly to Richmond, come hell or high water — or so it seemed. But a series of unfortunate circumstances and bad weather caused delays in Burnside’s plans, resulting in an ill-advised crossing of the Rappahannock River and assault on the Confederate rifle-pits above the town of Fredericksburg. For Horace, now a sergeant, it would be his last battle. He took a gunshot wound to the leg on that day and was returned to a Washington hospital where his leg was eventually amputated. He survived the wound but was discharged from the service in 1863. In recognition of his bravery, newspaper accounts state that he was promoted to 2d Lieutenant, but I could find no military record of this change in rank. The Thomas Balch Library at Leesburg, Virginia has a letter that Horace wrote his mother on 7 January 1863 from Stanton Hospital in Washington D.C. where he was recovering from the gunshot wound he received at Fredericksburg. He describes the placement and severity of the wound, as well as the treatment he received in camp and in the hospital. He also told his mother that many men were dying of their wounds after losing limbs. Within a year of returning from the war, Horace married Stella M. Mabury of Boston. He found employment initially as a grocery clerk and later as the owner/operator of his own stables in East Boston. Boston newspapers reported him among the sleigh-owners who used to parade their rigs through city streets upon the first big snowfall each year in Boston. One article in 1898 called out his “natty sleigh” in particular that Horace drove in company with his wife and daughter Lillian (1864-1954). In January 1900, Hiram sold his stables and adjoining property at the corner of Meridian and Eutaw Streets and relocated to Sharon, and later Medford, Massachusetts. He died in 1925. Horace was not the only member of his family to serve in the Civil War. Two older brothers also received wounds and survived the war. Barton Bass Derry (1830-1909) served as a first sergeant in Co. D, 39th Massachusetts. He was wounded on 8 May 1864 at Laurel Hill, Virginia. 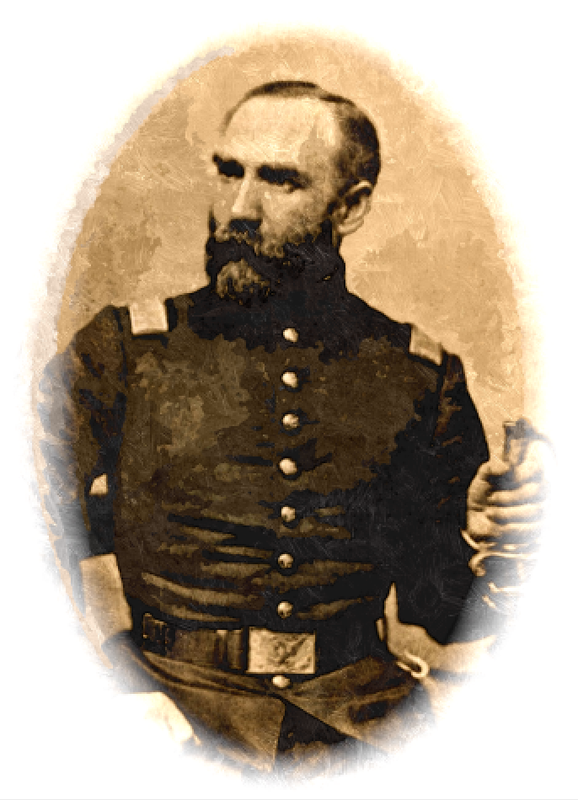 George Reed Derry (1831-1906) served in Co. G, 42nd Masachussetts. He was wounded and taken prisoner at the Battle of Galveston in January 1863. I will now try and answer your kind letter of the 1st. We are paddling around in the mud now up to our knees. It has been raining for 3 or 4 days but it is a little pleasanter today and we are drying our things. Yesterday in the afternoon, I was ordered to go and get 24 men and go on guard over to Gen. [Darius] Couch’s Headquarters and over we went through the mud. We stopped there until dark and then there was 24 more came and I went and found out there was some mistake about it and they told me I might take my men and go back to camp and back we went through the mud again and that is about the way things are done all of the time. I shall be lad when we get some of our old officers back that knows something. Captain [Ferdinand] Dreher ¹ has got command of the regiment now. He is a Dutchman. You know we have been on the march the most of the time since I came back. One day they marched us 20 miles and all we have on the march to eat is raw pork and hard bread. The boys find a great deal of fault and say they do not have enough of that. We are close to Falmouth and on the other side of the [Rappahannock] River we can see the rebels on picket and we expect to cross in a few days. The pickets are near enough to talk to each other. We do not get many letters now for the mail does not go nor come regular now and I do not think it will until we get into winter quarters and I don’t know when that will be. I do not see much signs of it now and for my part, I do not want to go into winter quarters. I want to fight it out and come home. Has [brother] Hen[ry] got home yet? You know you said he would be at home in two weeks but I guess he did not come. We have not been paid off yet and I don’t think we shall for some time. I suppose you know George Willitt is sick at Washington and I think he is better off there than he would be in the army for I do not think he is well enough to stand it this winter out here. If we don’t go into winter quarters, I think a great many of is will be sick for half of the time we lie on the damp ground with nothing under us but one blanket. I am sorry to hear that Stell [Stella A. Mabury] has been sick but I hope she is well now. She thought I had forgot the place where you lived and so she told me but I did not forget. You tell her I wrote a letter to her today and when I get time, I will write another one. Give my love to Hen[ry] and tell him I will write a letter to him as soon as I get time. I must close now. Give my love to all of the folks over to South Boston, Emme, and all of the rest of the folks, and to Stell. ¹ Capt. Ferdinand Dreher of Co. C, 20th Massachusetts, was killed at the Battle of Fredericksburg.